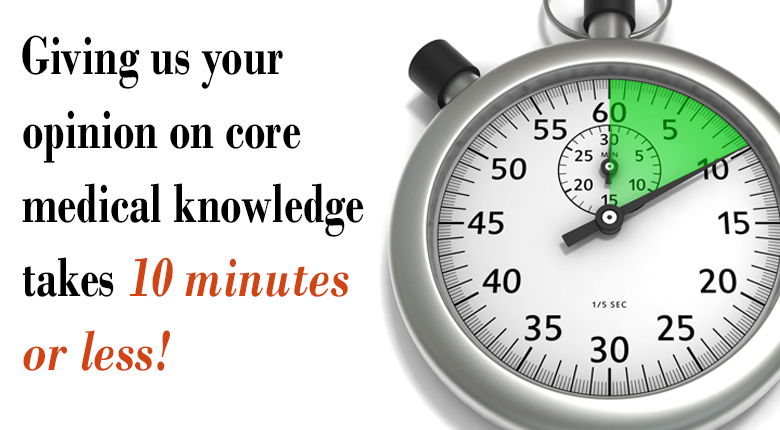 Can You Take 10 Minutes to Transform Recertification? Want an NCCPA speaker at your next PA event? Tell Us How You Celebrated the PA Profession's 50th Anniversary! On October 3, we announced details of an alternative to PANRE that NCCPA will pilot beginning in 2019 – news that proved to be a hot topic among certified PAs! NCCPA has received hundreds of emails and phone calls from PAs expressing support for the pilot or questions about the details. We have addressed the most frequently asked questions on our website. For an overview of the pilot, visit https://www.nccpa.net/alternative-to-panre. To go directly to the FAQs, visit https://www.nccpa.net/faq.aspx. Still have questions? Contact us at nccpa@nccpa.net; call (678) 417-8100 (M-F, 8:30 am – 5 pm Eastern); or interact with us on Facebook, Twitter or Instagram. By now you should have received your individualized survey on core medical knowledge. If you haven’t seen it, please check your inbox and spam folder for an email from nccpa@qualtrics-research.com. This is YOUR opportunity to help make PANRE and the upcoming pilot more relevant by answering questions about what constitutes core medical knowledge. The results will be used to create a new, narrower content blueprint for PANRE and the pilot assessment. Please note: THIS survey is formatted to collect segmented information from all PAs and should take 10 minutes or less to complete. Please complete and submit the survey today. Reminder: there are no changes to the blueprint for the 2017 and 2018 PANRE. If you are taking PANRE this year or next, please use the current content blueprint to guide your preparation. If you’ve been thinking about getting a CAQ in one of the seven specialties NCCPA offers but haven’t met all the requirements to take the exam, we have good news for you. To take a CAQ exam, you now only need to meet the CME and experience requirements before applying. The remaining requirement -- “Physician Attestation of PA’s Knowledge and Skills” form -- can now be submitted after passing the exam, hopefully alleviating some of the stress from the exam process. For more information on the CAQ program, visit https://www.nccpa.net/Specialty-CAQs. 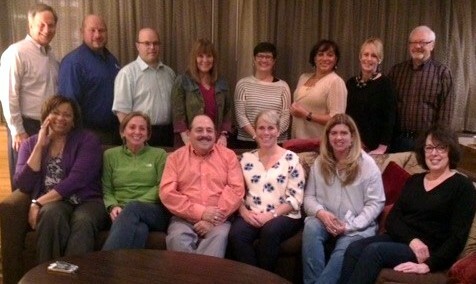 Leadership from the four major, national PA organizations (AAPA, ARC-PA, NCCPA and PAEA) met in Denver on October 29, following a very successful and informative PAEA Educational Forum. The meeting provided an opportunity for open dialogue on a range of cross-cutting issues facing the PA profession, including OTP and recertification. NCCPA appreciated the opportunity to meet with the leadership of its sister PA organizations and looks forward to our continued association and ongoing dialogue. We are proud to champion Certified PAs and to celebrate the achievements of the profession and the individuals who exemplify the many ways Certified PAs have a positive impact on patients’ lives every day. This year, we have been publishing weekly profiles of some of those PAs as we spotlight “50 PAs Making a Difference” in celebration of the 50th anniversary of the PA profession. In our June issue, we identified those who were profiled during the first half of the year. Since then we have showcased Donald Clark, PA-C; Roberta (Berta) Garvey, PA-C; David Parsons, PA-C; Donna Seton, PA-C; Dan Frazee, PA-C; Shirisha Vallarapu, PA-C; Bradley “Brad” Hamann, PA-C, Sampath (Sam) Wijesinghe, DHSc, AAHIVS PA-C; Jennifer Conner, PA-C; Jennifer McMurray, PA-C; John Reel, PA-C; Katharine Breaux, PA-C; Shannon Cornwell, PA-C; Jason Perrin, PA-C; Kristen Giltinan, PA-C; Meredith (Ditty) Bannon, PA-C; Christine Bruce, PA-C, Maj. Karen Salyars, PA-C; Keith Hustak, PA-C; Richard (Rick) C. Rohrs, PA-C, DFAAPA, SFHM; and Krisi Gindlesperger, PA-C. These PAs embody what it means to be a Certified PA, demonstrating that when it comes to providing high quality health care, promoting wellness, impacting communities, and saving and changing lives…#PAsDoThat! If you know any of these PAs, reach out and congratulate them! Go to http://pasdothat.net/Celebrate each week to see a new spotlighted PA and to read about the past recipients above. 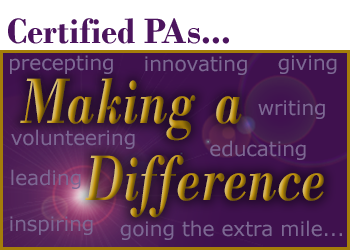 NCCPA and the nccPA Health Foundation celebrate these and all Certified PAs who are making a difference in your communities and beyond! The 2017 Board of Directors of NCCPA is chaired by Mary Warner, MMSc, PA-C. Before serving as chair of the 16-member Board of Directors, Mary chaired NCCPA’s Research and Test Development Committee. As chair, she is responsible for ensuring the integrity and effectiveness of the Board’s work. 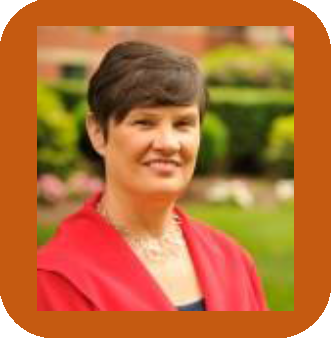 Mary currently serves as the founding Director of the Boston University PA Program. In that role, she is responsible for the development and oversight of all aspects of the PA Program including faculty and student services, curriculum development, planning, implementation and outcomes assessment. Prior to coming to BU, she served as the Associate Dean and Program Director for the Yale School of Medicine Physician Associate (PA) Program for eight years. Additional educational roles include service as Assistant Director for Didactic Curriculum at the Yale PA Program as well as Adjunct Clinical Instructor at Quinnipiac University PA Program. She received her Master of Medical Science degree from Emory University and practiced in emergency medicine, cardiac surgery and orthopaedic surgery for 9 years before becoming a full-time educator, and part time for six years after becoming a PA faculty member. Mary has served in PA leadership positions as the Student Academy of the AAPA Chief Delegate to the House of Delegates, ConnAPA member-at-large as well as President and PA Member of the Connecticut Medical Examining Board. As a site visitor for the ARC-PA, she is versed in the standards of excellence for the education of physician assistants. She has served as visiting professor internationally and is invited to present regularly at regional and national professional meetings. Her manuscript entitled, “Career Patterns of Physician Assistants: A Retrospective Longitudinal Study” won two publishing awards in 2014 including Research Article of the Year. She was the senior author on the 2015 Research Article of the Year for the collaboration with Dr. Gerald Kayingo. Her work in Uganda with the Medical Clinical Officer (MCO) profession brought the first continuing medical educational program to practicing MCOs. In addition, she advises and mentors faculty and leads an active research program focusing on career patterns of physician assistants. NCCPA is proud to have been led by such a dedicated clinician, educator, research and PA advocate during this 50th anniversary year. With the announcement of the alternative to PANRE we will soon pilot, we are getting numerous requests for speaking engagements. We welcome the opportunity to speak to PAs directly as often as possible! If you would like an NCCPA representative to talk about recertification changes and answer questions at your 2018 state or specialty event, please fill out this form. We post NCCPA’s upcoming speaking engagements on our social media sites, so be sure to like us on Facebook and follow us on Twitter, LinkedIn and Instagram. This month, the nccPA Health Foundation joined more than 200 healthcare organizations signing on in support of the Shared Principles of Primary Care. The Shared Principles align with the Foundation’s vision to improve the public’s health and access to affordable care and its efforts to foster integration of oral health and mental and behavioral health as part of comprehensive, equitable, and accessible care. The development of the Shared Principles was led by the Patient-Centered Primary Care Collaborative (PCPCC) and Family Medicine for America’s Health and included a diverse group of public and private organizations from across the healthcare industry. Learn more about the Shared Principles and this movement here. Do you want to promote equitable and accessible care in your community? Apply for up to $1,000 in funding as part of the Foundation’s Be the CHANGE grants program. Tell Us How You Celebrated the PA Profession's 50th Anniversary? The PA History Society is collecting 50th anniversary short stories and photographs from PAs, PA programs, PA organizations, and others. We’ll feature your PA Week and 50th anniversary celebrations on the PAHx website and social media over the next several weeks. Please send your digital photos and event descriptions to us at: contactus@pahx.org. Dawn Morton-Rias, Ed.D, PA-C, writes about changes and trends in Celebrating 50 Years as a Profession, published in Physicians Practice. Three Certified PAs are highlighted in this article on 6 Ways PAs Contribute to Emergency Departments, just published in Fierce Healthcare. What’s Happening at NCCPA? Check out our new video “September 2017: NCCPA in 60 Seconds!” which portrays just some of the things that happened at NCCPA last month.